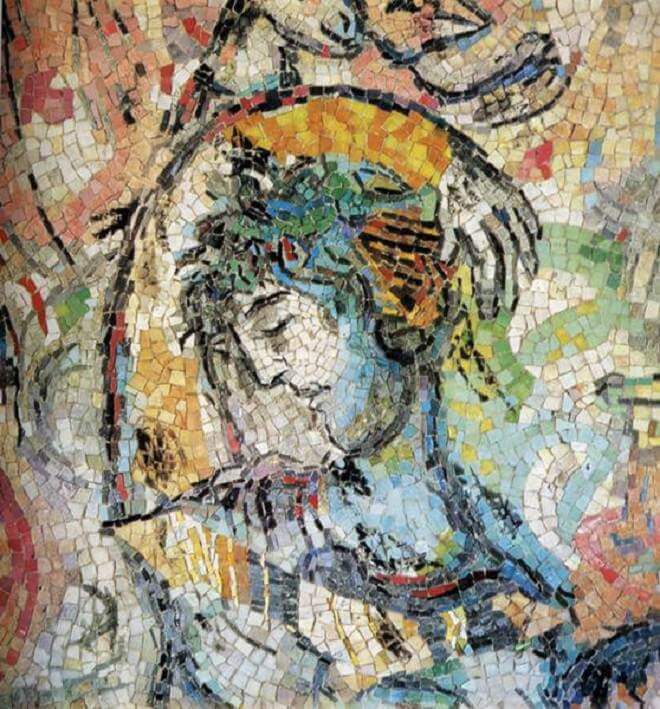 In January 1967, the Dean of the Faculty of Law at the University of Nice requested Chagall to make a wall picture for the Faculty's newly erected building; Chagall agreed to the idea, and they settled on a mosaic. 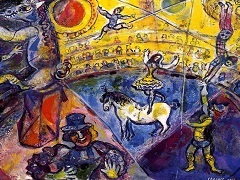 Chagall had recently worked on a large mosaic for the new Parliament of Israel, and was thus familiar with the technique. In Nice, a wide corridor on the first floor, leading to the lecture rooms, offered a suitable wall measuring 9'x36' which, with its windows opening on the coast and the sea, presented a desirable connection with the Mediterranean scene. 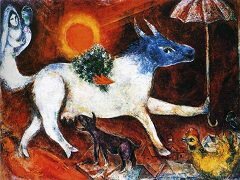 Chagall had just made a present of his Biblical Message - a series of large pictures on Old Testament themes - to the city of Nice, and now wished to present the young students not only with a work of art but with a comparable message. The Dean of the Faculty suggested the theme of "Odysseus, Mediterranean hero of wisdom," referring to the essays by Gabriel Andisio, published in 1945, Ulysse ou Vintelligence. He also suggested a group of suitable scenes - Calypso, Polyphemus, Circe, the Sirens, Nausicaa, the return to Ithaca - which exemplify overcoming all temptations and cruelties by virtue, courage, and wisdom, and the final triumph of humanity, freedom, and peace. 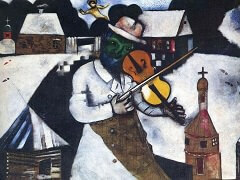 This proposal met with Chagall's full approval. During his visits to Greece in 1952 and 1954, he had marveled at the strength and sweetness of the Greek landscape and its mythical background, and had come to realize that the Acropolis in Athens was the necessary counterpart to the temple in Jerusalem; the brightness and lively vigor of everything Greek formed the counterpoint to the solemn holy splendor of Jerusalem. 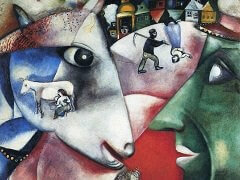 All the richness of Western culture stems from their interaction. 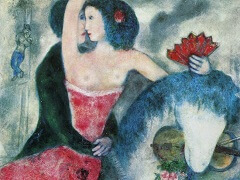 With the Odysseus theme Chagall wanted to depict "the multiple sources of the Mediterranean soul," according to the inscription carved in the marble dedication plaque. But the message for mankind was to be that man, through wisdom, courage, and faith, can overcome all his trials and, like Odysseus in Ithaca, be able in freedom and peace to fulfill his human responsibility - the care of his home and the service of the community. The detail here, showing the head of the dreaming Odysseus, can give only a rough impression of the brilliance and richness of the color sequence. 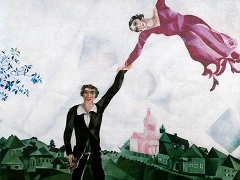 It does show, however, how the concise abbreviated drawing blends entirely with the close, tapestry-like web of the color and is actually raised up by the movements of the color.